It’s time to move forward! Today, I would like to tell you about the 24option broker. As the company has a good reputation, and all traders dealing with it are satisfied with the service, I decided to write a comprehensive review of 24option. The reviews typically start with such points as where a broker comes from, how long it runs the business, whether the company is officially listed etc. What I have to point out is that the broker is very large and strong. The website of the company is available in 18 language versions. The broker is certified by CySEC and popular in developed countries. However, I don’t want to take up a lot of your time telling you all these details, so I’ll just get to the point. Once you browse the broker’s website, the first thing stricken your eye is the black color. However, after a couple of minutes you got adjusted to it and feel comfortable. After you log in, the homepage becomes your basic investment platform. Here you can find all you need for binary options trading, that is, different types of binary options, charts, settings, underlying securities, and history. I can tell you this is really convenient. The default tab is All. It enables you to see the list of all underlying securities provided by 24option. The convenience is that you don’t need to switch between the Currency, Index, Stock tabs when choosing an underlying security from the list. All underlying securities is in one column, and you can invest in any of them right there. 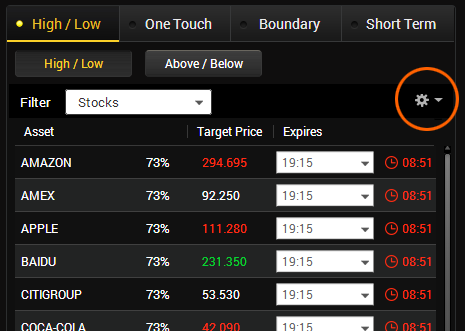 One more plus is that you can see in the 24option menu even those underlying securities that are not traded at that moment. One more advantage is that there is a comment next to the underlying security showing the time when you can buy it, for example, today at 4:45 p.m. Besides, if you want, you can change personal settings. For example, you look through the long list of all underlying securities and choose a couple of items. For you not to search the chosen underlying securities every time, you can create your personal list. After checking, you click on the Apply button and see the chosen securities on the main page. Providing the platform respected and trusted by tens of thousands of users, 24option offers an attractive reward-to-risk ratio to newbies to make the first step into the world of binary options as easy and safe as possible. For this purpose, there is a no risk trading service. The point of this service is that you get a bonus to your account from 24option after you top on your account for the first time. The bonus can reach up to 50% of this amount. For instance, if your first payment is $1,000, you get a 50% bonus. Thus, the amount on your deposit account increases to $1,500. 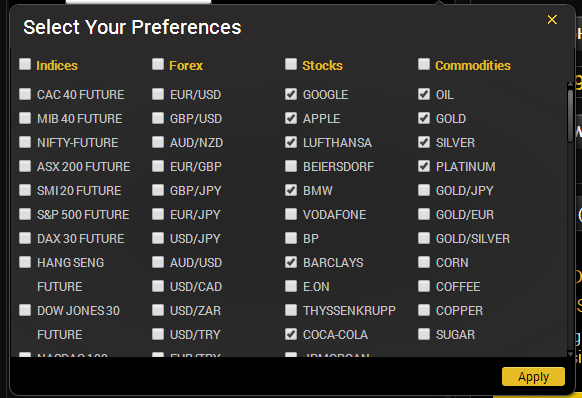 Firstly, the broker offers unique underlying securities like s Nike, IBM, Sony, Samsung stock… These are reputable companies, therefore you can easily find news on them and make a profit.Secondly, trading with this broker means interesting terms of binary options trading. Typically, most brokers offer to invest at the beginning or middle of an hour. 24option provide more flexible terms like 10:30, 10:40, 10:50… It even offers 10:25which means that your option expires after half an hour, to be more exact, after 25 minutes. This feature can be of special interest to the investors dealing with currencies as it enables them to close a position before news releases in the middle of an hour and, consequently, price fluctuations.One more plus is that you can invest in binary options not only for 60 seconds, but also for 2 and 5 minutes. This is really useful stuff, especially to the investors who do technical analysis. 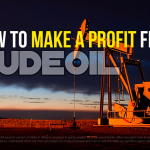 This gives you a chance of generating a 75% profit in just 5 minutes. To add or withdraw money is quite easy. I do not even know what to explain. You need to sign up and top on your account in any convenient way. Minimum deposit is $250. Minimum investment is $24. I like the chart provided by 24option. It’s not as small as other brokers offer. The red line on the chart means the latest available time when you can invest in the nearest option. For instance, if the nearest expiry time is 11:00 a.m., the red line is at 10: 50 a.m., and you can invest minimum for 10 minutes in classic binary options. Also, 24option offers such type of binary options as Boundary. 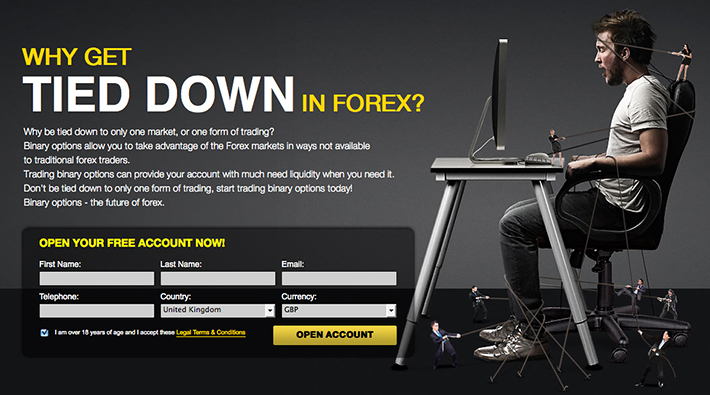 This is really interesting type of binary options. Trading these options, you need to figure out whether the price will stay within some boundaries, say, from 1.37790 to 1.37608 during next 10 to 30 minutes or break it, that is, whether it will be lower than 1.37608 or higher than 1.37790. These options yield up to 70%. The subtype of this binary option is High Yield Boundary. It is distinguished by a 200% to 350% profit! The point is that the price range is wider than in case of ordinary Boundary. I explain through my own example that to make a profit with 24option is quite easy and convenient. Next, I set the expiry time to 19:30. Then, I set the amount to $25. Minimum amount to buy an option is $24, but I decided to round it. At the bottom, I saw the amount paid out in case the price would be lower than at the moment of buying, that is, $43.25 composed of $25 investment and a 73% or $18.25 profit. As the chart shows, the price went down, and I made a profit. 73% in just 176 minutes is not bad. This is a unique service from 24option for VIP-investors. 24signals is designed for an investor who adds $5,000 and more to the account. VIP-investors are provided with a personal consultant teaching them how to trade. The classes are conducted online via Skype. Like all binary options forecasts, you need to compare 24signals and your own analysis. You shouldn’t blindly rely on them. These signals are similar to forecasts, and you should pay attention only to the strongest. I think that these signals are good stuff as an additional instrument of analysis. However, if you cannot become a VIP-client right now and get an access to the signals, don’t get upset as this is just an additional feature, not the key to success. Analysis of any underlying security has to include multiple methods. 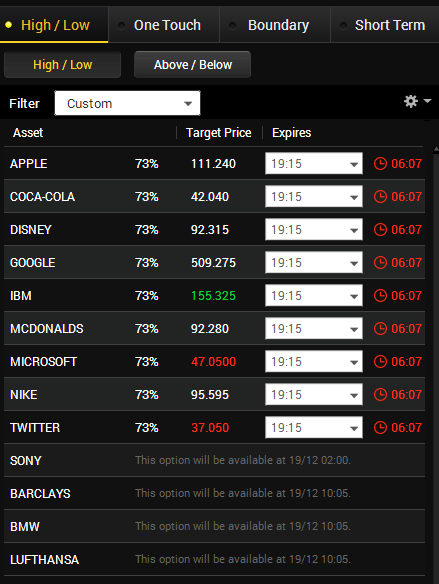 24option makes every effort to help its traders enhance their efficiency. The 24option Education Center enjoys wide popularity due to a great number of various video tutorials, e-books, webinars etc. 24option webinars are worth of specific mentioning. 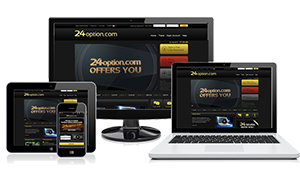 24option regularly conducts webinars with the leading specialists in binary options trading. Moreover, holders of the Diamond and Platinum accounts can participate in the individual webinars during which an experienced tutor shows on a real-time basis the most successful strategies to trade and choose an underlying security. The broker enjoys great popularity in developed countries. This means that the company meets the high standards of the EU and the United States. Generally speaking, I haven’t found any disadvantages or weaknesses in the company. Taking into account excellent reviews and comments, other investors also haven’t.